Get out of my parking space! Is that we call a Turkish bath? Poor 'Pride of Calais'. Only met her end because she was built for one route. Actually a little while ago that this happened - she's nails now. Have you ever wondered how scap ships are beached?? This one - did she sail by the name ATLAS at some point in her career? yes the ''aquarama'' J-O,she have her own thread. it's over for the ''kalakala''. Last edited by janihudi; January 25th, 2015, 22:33. There are some pretty good HD-videos on youtube from KALAKALA's final journey. Highly recommend some of them! A pity this quite so special vessel is now heading to the scrap. Now, and into the future, nothing like this will ever be built again. Now, it's all about profit and not at all about style. Who is stopping Owners from selling the ship to a third party, which is normal practice when a ship is due to be scrapped? 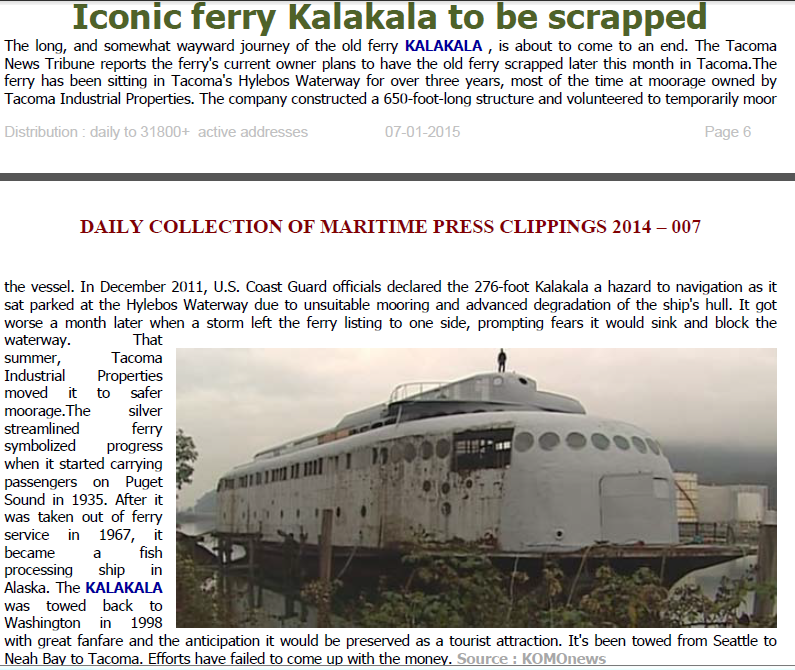 The new owner change name and flag before the ship is sold to a scrapyard. It arrives at the scrapyard without an EU Flag. The IMO No. remains, so it is possible to identify the vessel as a former EU owned and flagged ship, but are they going to ban Owners from selling their ships to a third party outside EU at any time? Ships will eventually be scrapped. A lot of vessels owned by EU Owners are under FOC flag, will they try to stop these from being beached as well? It looks to me like they are trying to discourage anybody from register their ships under EU flag, or even from owning and operating ships by European domiciled companies. Maybe UK will gain from this, when they leave the Union? Is the UK planning to leave the union? I hadn't heard of that; only that Greece may be forced to drop out at great cost to them money wise due to exchange rates. No. Our new government has promised an 'in / out' referendum by the end of 2017 in order to give the population a say in whether we stay in or out of the European Union for the first time since the 1970s. There is quite a vociferous anti-EU movement championed by some of the newspapers, but there is also a significant element of support for staying in the EU. As ever in these things there are relatively complex issues that haven't fully been debated yet - largely around issues of immigration and perceived loss of power to Brussels. All of the major parties have a 'pro-EU' stance - albeit that a renegotiation of some of the terms is sought, particularly related to countries having to pay tax credits or benefits to people moving within the EU to look for work (or just moving!). The one party that has an anti-EU stance, UKIP, did poll around 4 million votes in the May election, but only won one seat (out of 600) in parliament. Of course that's different to Greece who may have to drop out of the Euro currency - the UK has retained the pound. 'Grexit' would see Greece leave the Euro, 'Brexit' would see the UK leave the EU. Thanks, Mark. I can see value in both arguments for/against staying with the EU. With regard to the benefits of selling to the scrapyards or to a foreign buyer - which is better or preferable? I often visit the Old freight Ships site and see truly ancient pre 1950s ships still in working order but rusted and damaged, mostly in Asian ports. Selling a ship for scrap is part of normal cycle of life for ships but is not always because the ship has become old and obsolete. Some owner sell their ships for scrapping to get them off the market in order to obtain higher charter rate or freight rate for their other ships. The price for scrap ships are quoted in "light displacement tonnes" (LDT) which is the weight of the ship without cargo, bunker and stores, as stated in the Stability Booklet. When a ship has solid ballast, a lot of wood or other non-metallic materials as part of it's fixed structure, this is deducted. For ships containing more than normal amount of non-ferrous metal a premium may be paid. I was involved as third party surveyor to determine the LDT of an old Crane Barges, where there were both liquid and fixed ballast, wooden decks and fenders to deduct and a lot of machinery containing non-ferrous metals, incl. a 3000 s.ton Crane, 10-point mooring system and large amounts of spares, loose equipment and stores. The former Owner had also removed some of the fixed equipment that could be used on their other barges, thus the stated LDT was no longer valid. How to determine fair value of anything like that? I got accurate draft readings and salinity test of the water where the ship was at anchor to determine the actual displacement at time of survey. Then all tanks were sounded to determine the weight of all liquids on board at the time. That give the actual LDT, but no buyer would want to pay for cement used as ballast and wood cladding at steel price. The amount of cement ballast was found in old records at time of conversion. The area of wood cladding was determined from drawings and the thickness measured to get the volume of wood. But what type of wood?? That had to be determined to get the sp.g. and thus the weight. Having been converted in Holland some 20-odd years earlier the wood was likely to have been partly replaced, if not completely renewed, so a compromise had to be found. It was agreed that it was hardwood of some sort. The sp.g. for various hardwoods were found in the "Stowage Table" and a factor agreed upon. A walk-around together with representatives from Seller and Buyer to determine the amount of valuable non-ferrous metals over and above what you would find on a normal ship finished off the process. Since this was a barge there were no propeller and no main engine, but the crane and mooring winches contained quite a lot. I decided that to be of equal value to what you would find on a normal ship. No premium and no deduction required. But what about all the spares, loose equipment and stores, which included miles of wires on the crane and scrap metal that the Owner had placed on board in order to get rid off, without having to transport it to a scrap dealer, or a smelter? The weight of that was given by the draft survey, minus the above non-metallic items. Transaction completed and the barge taken in tow to Bangladesh. End of story. Rather more complex than I thought it was. Thanks for the enlightenment. Both Drillships, Semis and Jackups are heading for the beaches, many of them rigs I have been involved with in some form or another over the years. I know that the main interest among CVF members is the faith of older Cruise ships, but they are only a small part of the ships being broken up. Tankers, bulkers and container ships are the main stay of the business. As mentioned in the Maasmond Newsclippings yesterday the Laybarge Castoro 7 is on her last voyage, bound for Alang and a breakers yard there. She was built in 1975 and originally named Viking Piper, owned by Hilmar Reksten in Bergen. Later she became LB 200 for McDermott, Argecy Piper and finally Castoro 7 for Saipem. I was Marine Adviser for McDermott on this one in 1981. Death and injuries in Pakistan Breaking yard. Very calm and collected crowed on the bridge. It is an awful feeling beaching a ship like this, unless you are doing it for the upteened time, like Capt. Singh here.